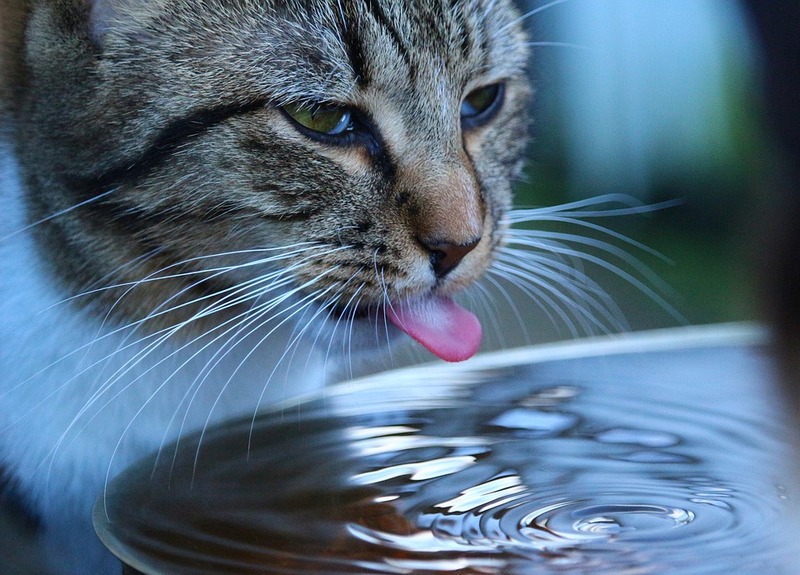 It's been hot out lately, and not only is it important for you to always stay hydrated, but it's important for kitties too! They should get between 8-26 tablespoons of water a day depending on activity level and size. Some of the signs that your cat isn't drinking enough water are dry gums, decreased skin elasticity, being lethargic (although with cats that's a tough one to notice, since they sleep so much), loss of appetite, and peeing less than normal. If you notice any of these signs take them to the vet because there's lots of consequences for not drinking enough water! They could get heat stroke, have diabetes, kidney disease, or a urinary tract infection. I'm not just saying this, I know from experience. About 7 or 8 years ago we noticed our Vicktor peeing on our papasan chair. He slept on it all the time, but then out of the blue he started urinating on the cushion. That was very out of place for him. We took him to the vet and found out he had urinary crystals. We were told it's very common in male cats because of the way their internal urinary tract is curved. I'm so glad we caught his infection in time, better safe than sorry, (but we weren't able to save the chair ~ it was comfy too!). Ever since then, we give Vicktor a prescribed Cosequin caplet in his food daily to prevent bladder irratation. We also started adding water to his wet food to help him pee more and keep things moving. So yes, cats definitely need water too. 1. Put out one bowl of water per cat. Most prefer shallow bowls that fit their whiskers, although some like sticking their head in a glass of water, so put out a couple different sizes and see what works. 2. The bowl should be glass, ceramic, or stainless steel because plastic can harbour bacteria and make the water smell funny to cats. Plastic bowls can even cause feline acne. They have tons of cute options out there that aren't plastic. 3. Speaking of smell funny, if you give them tap water, the fluoride might smell and taste funny so try filtered water. 5. Add water to wet food for even more moisture. We do this with Vicktor and it helps. 6. 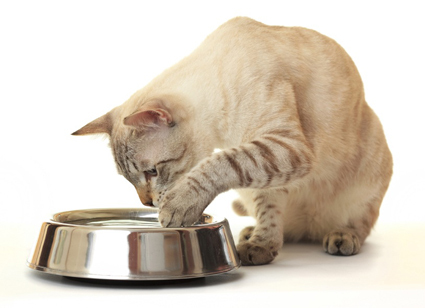 Try adding low-fat and low-sodium broth, or tuna juice from canned tuna to their water dish. Even though it's not water, it fluid. 7. Make broth ice cubes and add them to their water or even regular ice cubes might peak their curiosity and encourage them to drink more. 8. Try cold water, some cats don't like it room temperature. 9. Make sure the bowls aren't tucked in a corner where your cat can feel vulnerable and has to have it's back to the space or can't get out. It helps to place several around. Like kitty litter and litter boxes, you have to experiment to see what your cat likes. Vicktor and Ginger are a little odd in that they will only drink from one bowl. We've put of different ones around the house, but they both will only drink from the one, so we just make sure it's full and clean. 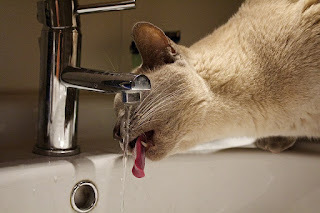 Find a good method for hydrating your cat, in the long run you'll be glad you did!